"When Lee Harvey Oswald Shot the President, His Mother Tried to Take Center Stage"
On November 25, 1963, the nation’s gaze was transfixed by the horse-drawn caisson and final burial of President John F. Kennedy. But in the shadow of this grim but stirring procession—on that same Monday—Lee Harvey Oswald was quietly buried in Fort Worth, Texas. As Secret Service, FBI agents, and a heavy police guard stood watch, seven newsmen serving as volunteer pallbearers carried the pine coffin to the grave. 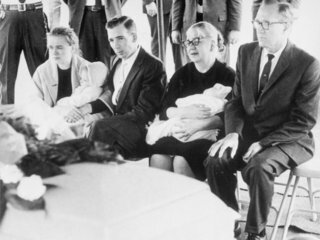 Before the casket was lowered, the lid was opened for the family to see Oswald’s face one last time. As UPI reporter Preston McGraw noted, "One at a time, quickly, the two women bent down and kissed the corpse."